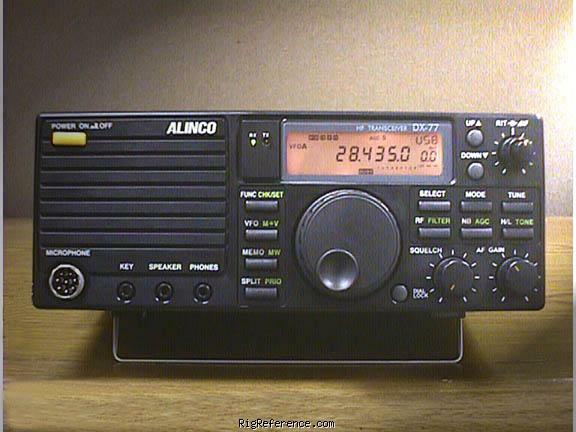 The Alinco DX-77T was designed from the beginning to be a quality amateur radio transceiver with full features, but at a price everyone can afford. The DX-77T covers 160 to 10 meters in SSB, CW, AM, DATA and FM. The transmitter delivers a powerful 100 watts in SSB, CW and FM (40 watts on AM). (An internal slide switch selects 50 or 100 watts output). The receiver tunes from 150 kHz to 30 MHz. The high contrast LCD keeps you informed on operational parameters and is adjustable for brightness. Other features include: IF shift, dual VFOs, 100 memories, band and memory scanning, adjustable beep and sidetone volume, attenuator, RIT, dial lock, CW keyer, CW audio filter and NB. Rear panel connectors for external amplifier, antenna, power, computer control/cloning. To use the modern venacular, it "does what it says on the box". It's very simple to operate, without complicated menus to learn. OK, it doesn't have all the "bells and whistles" of other rigs; but be honest, do you really need them? Most hams I know, don't use half of the gizmos and gadgets on their 'top-of-the-range' rigs. I bought mine brand new when they first came out, and have used it every day since then. Everyone I've spoken to, locally and dx, remark about it's superb audio; and if I can hear someone, I can usually work them. The front-facing speaker makes it easy to listen to, especially when 'stacking' rigs; and the mike/key/ext.speaker/headphone sockets are just where you want them. From new, I've always used the matching desk-mike (EMS-14)and auto-tuner (EDX2) without any problems. Prior to, and since, buying this rig, I've tried all the usual other makes and models within my budget, but I still keep coming back to it. In fact, I've just bought another one off eBay, to run alongside, or should I say (literally) on top of, my existing rig. Others may come and go, but my Alinco DX-77s are here to stay. If, and I do say 'if', I was going to upgrade, I would have no hesitation in buying the Alinco DX-SR8 (maybe one will come up on eBay soon). Estimating the value of a rig can be challenging. We collect prices paid by real hams over the years to help you estimate the current value of the Alinco DX-77T. Just bought or sold this model? Let us know what you traded it for and help other ham operators!